With our proud veterans leading the Addison Township Strawberry Festival Parade, the fire engines sounding out their cavalry charge, and the delicious strawberry sundaes tantalizing your taste buds, this colorful Strawberry Festival event held Saturday, July 18, is too much fun to miss! 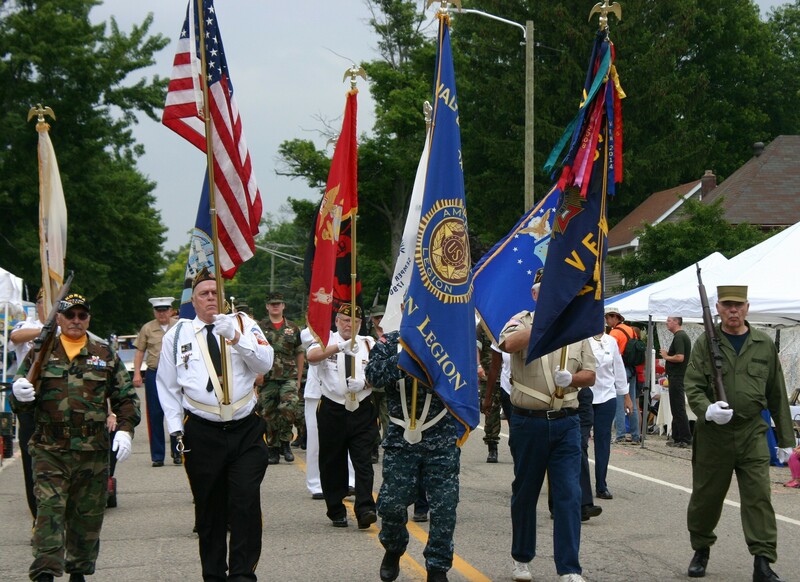 The parade is at noon in downtown Leonard, Michigan, located on the corner of Elmwood and Rochester Roads. Grand Marshalls are Wes and Linda Douglas, and Janet Ostrander. Our lovely Princess this year is Sarah Phelps and our handsome prince is Jaidan Remer. There will be a train, an obstacle course, a giant slide, and a tropical maze. All rides are free thanks to the dedication and year-long efforts of the Leonard Festival Committee. Music will be by Wayne Sutherby. Entertainers include; Patsy Cline, Brenda Lee, Connie Frances and Johnny Cash impersonators. Street dancing will begin at 7 p.m. with “Haulin Elis Band” and continue until 10 p.m.
Bring your jogging shoes for the Addison Township Public Library “Born to Read” 5/10K run which begins at 8:30 a.m. And don’t forget about the little goats, bunnies, and chicks at the petting zoo hosted by Upland Hills Farms. 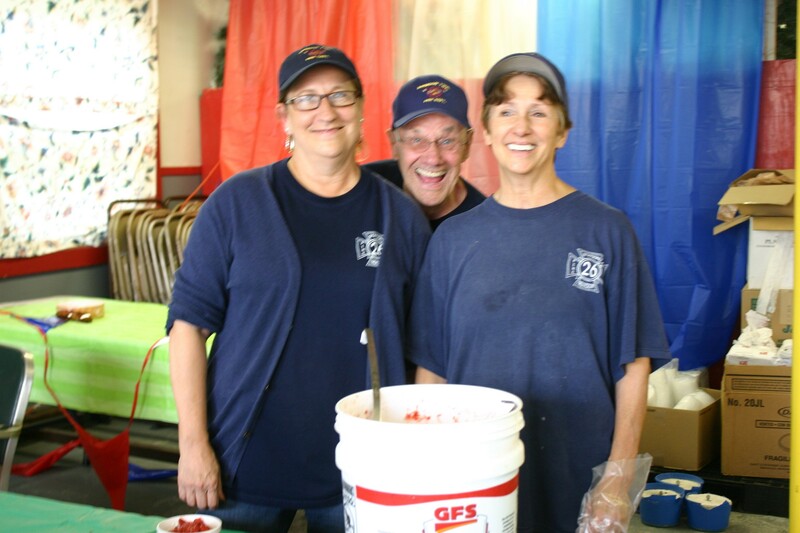 Strawberry Sundaes dished out by our brave,and often fun loving firefighters (see picture below). Johnny Spezia’s piglets, Sheepshank Sam, and Woodcarver Kona Ice. Car show at Cooper Standard Automotive parking lot. Book signing for Wilted Dandelions at the main table from 1 to 3 p.m. Be sure to get a signed copy for a friend and your special gift upon purchase. There will be prancing ponies to ride and colorful booths to shop at. Upland Hills, with their farm animals, will provide educational and fun-filled activities. Come hungry and enjoy a fantastic pancake breakfast at the historical Leonard United Methodist Church from 8 a.m. to 10:30 p.m.; for lunch enjoy Randy Klein Big R BQ or Leonard Market’s delicious pizza. Log onto www.strawberryfest.net for more information. Thought you might enjoy this article I did for Southern Writers Magazine before Wilted Dandelions’ publication! Wilted Dandelions is now in the final editing stages. I feel like an expectant mom all over again. 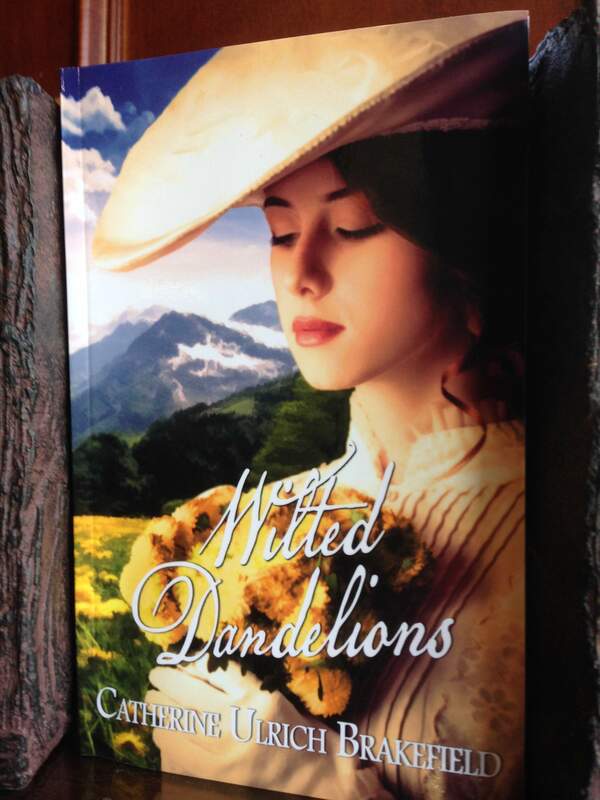 My mind crisscrosses the nine months of Wilted Dandelions gestation, the research, editing, and more editing that went into this historical romance. The final proofing was not easy for me. This is it. Once Wilted Dandelions goes into print, it is out there for the world to see. My mind raced along like a fireman to a house fire. Should I change this dialogue? Does that ever happen to you when you do your final edit? I always liked to check the “what ifs” of a situation. Just like when I was pregnant and ready to rush to the hospital with my second child. It hadn’t been an easy pregnancy. I had gotten labor pains four week before my due date. Now that my children have left my maternal nest, the characters in my books have, in a way, replaced them. Rachael and Jonathan Wheaton, the heroine and hero in Wilted Dandelions have become as real as one of my family members. I want Rachael and Jonathan depicted as I see them in my mind’s eye—alive, vivacious, dressed to glow with vitality, and their voices strong and poetic. Did I forget anything? Are the characters and scene depiction strong enough to carry my reader back into the 1830s, into that time machine of words and imagination I envision? 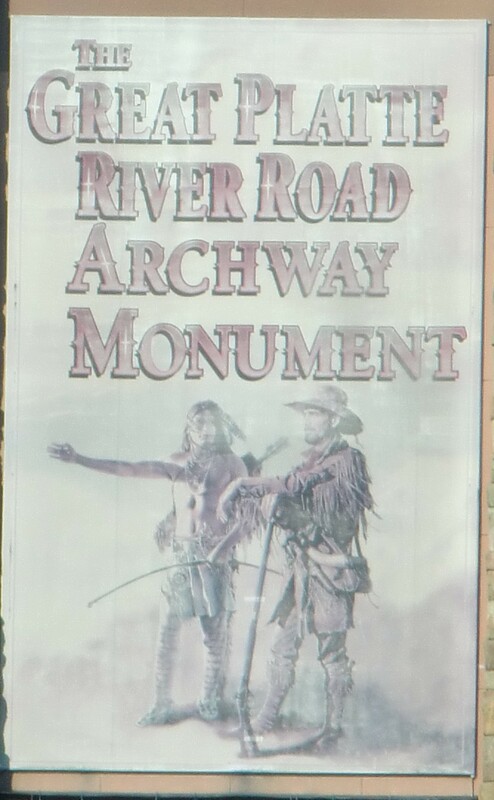 Back to the western frontier before the Oregon Trail was a reality, before there were states to mark the vast unknown? Memories pelted my thoughts like a thunderstorm. My contractions were coming; only they didn’t feel right … my baby wasn’t due for another week. Prov. 3:5 immediately came to my thoughts, “Trust in the Lord with all your heart, do not rely on your own insight.” The encouraging voice of my obstetrician confirmed this. “Your baby is healthy and he will do fine.” With my faith renewed, my confidence escalated. “At some point we just have to let go.” My publisher had e-mailed me. Her words provided the confirmation of faith I desired. Yes, dear authors, we have to let go. Our new creation must come out of our hearts and computers, become the printed word in order for our readers to enjoy our characters and story. Just as I held my bundle of joy in my arms, so perfectly formed by God’s hands, I know a mustard seed of awe will be present when I caress Wilted Dandelions with loving fingers, and whisper a prayer to my Maker and Savior, Jesus Christ, to bless the words and characters within Wilted Dandelions and to perform their mission and reason for existence. Do you sometimes feel overwhelmed portraying the creator with your characters? Awed, knowing you are also beautifully created by a loving God? Does your stomach feel the butterflies, knowing this is the final hour? Your final proof is finished and you pray God will be honored above all else? Thanks so much for having me today and may God richly bless you! Catherine Ulrich Brakefield is an author of two non-fictional history books, and two inspirational historical romances, The Wind of Destiny and Wilted Dandelions.